Good news! Only a few minutes every day solving puzzles and you will boost your chess! If you want to improve your game the fastest, easiest and most fun way, start solving puzzles right now. 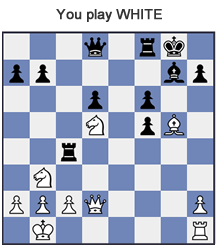 One thing that is absolutely undisputed in chess training philosophy is: solve tactical chess puzzles regularly and you'll get better and better everyday. Have fun while you improve your chess! 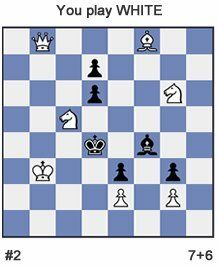 Train your abilities facing chess studies from the most complete database of problems, created by the greatest composers. "I always urge players to study composed problems and endgames" Pal Benko. Just a few samples of recently added games to our database. Train your tactical ability, exercise your calculating skills and candidate moves evaluation. Regular training sessions will boost your chess playing level. Supporters get unlimited access to the thousands of tactics in the database. Basic Members are limited to 10 puzzles a day. 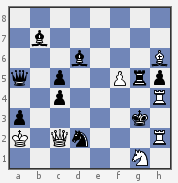 What are the Chess Problems? How can I start solving problems? What are the Rated / Unrated rating mode? What are the Standard / Advanced solving mode?